The 1,000 Mile Motor Test. Why Are We Behind The World. The London To Edinburgh and Back Test. A rare original article from the Harmsworth London Magazine, 1901. The Harmsworth London Magazine. London, 1901. First Edition, Disbound. Very Good. 6 Pages, with photographs. Note; this is an original article separated from the volume, not a reprint or copy. Size: Octavo (standard book size). Quantity Available: 1. Category: Harmsworth London Magazine; Inventory No: 248076. 6000 Miles Through Unknown Tibet. A Wonderful Journey over Trackless Deserts as Described by The Great Explorer, Dr. Sven Hedin, to His Friend L. Le Mesurier. A rare original article from the Harmsworth London Magazine, 1902. The Harmsworth London Magazine. London, 1902. First Edition, Disbound. Very Good. 5 pages and 5 illustrations. Note; this is an original article separated from the volume, not a reprint or copy. Size: Octavo (standard book size). Quantity Available: 1. Category: Harmsworth London Magazine; Inventory No: 244798. Ambrogio The Brigand. 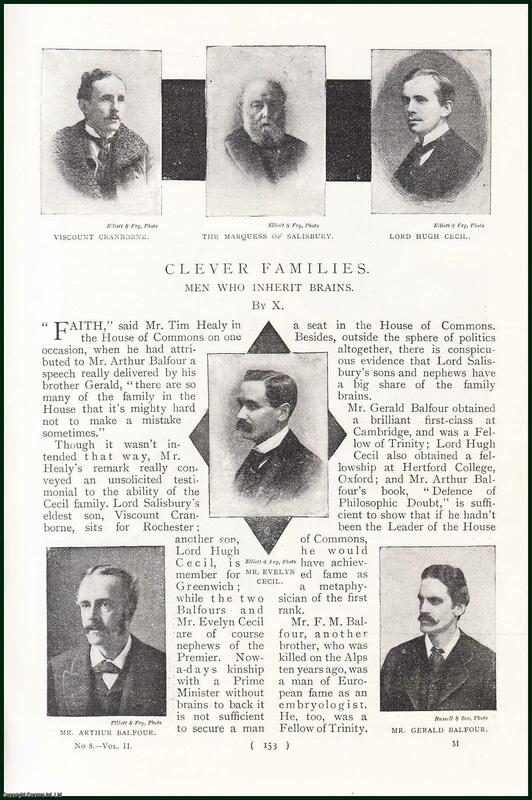 A rare original article from the Harmsworth London Magazine, 1901. The Harmsworth London Magazine. London, 1901. First Edition, Disbound. Very Good. 2 pages and 1 illustration. Note; this is an original article separated from the volume, not a reprint or copy. Size: Octavo (standard book size). Quantity Available: 1. Category: Harmsworth London Magazine; Inventory No: 244654. American Wives of English Husbands. Some Charming Links in the Anglo-American Alliance. 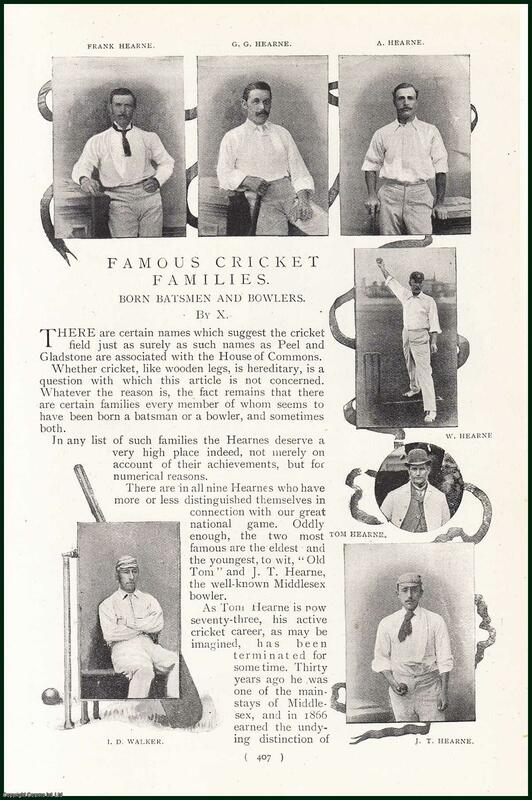 A rare original article from the Harmsworth London Magazine, 1898-99. The Harmsworth London Magazine. London, 1898-99. First Edition, Disbound. Very Good. 8 Pages, with photographs. Note; this is an original article separated from the volume, not a reprint or copy. Size: Octavo (standard book size). Quantity Available: 1. Category: Harmsworth London Magazine; Inventory No: 247869. 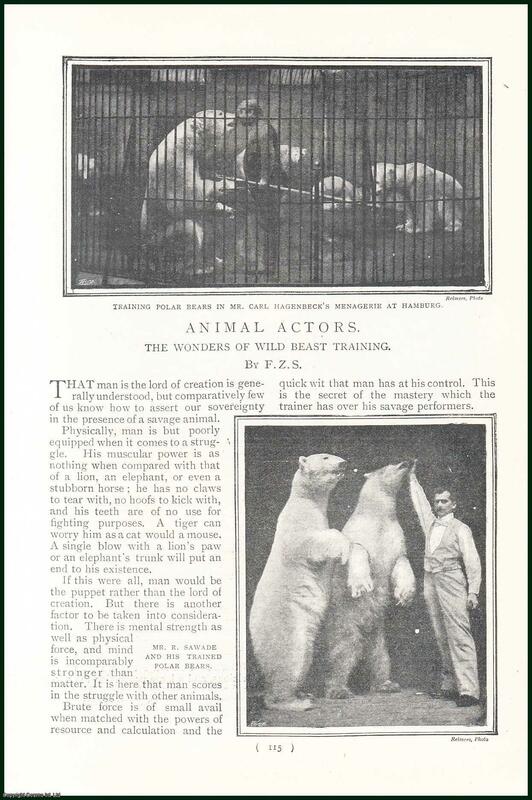 Animal Actors. The Wonders of Wild Beast Training. 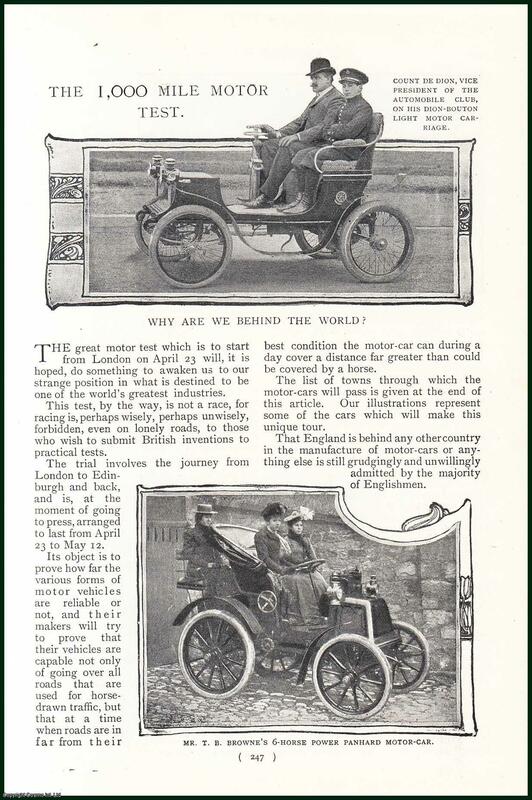 A rare original article from the Harmsworth London Magazine, 1901. The Harmsworth London Magazine. London, 1901. First Edition, Disbound. Very Good. 6 pages and 7 illustrations. Note; this is an original article separated from the volume, not a reprint or copy. Size: Octavo (standard book size). Quantity Available: 1. 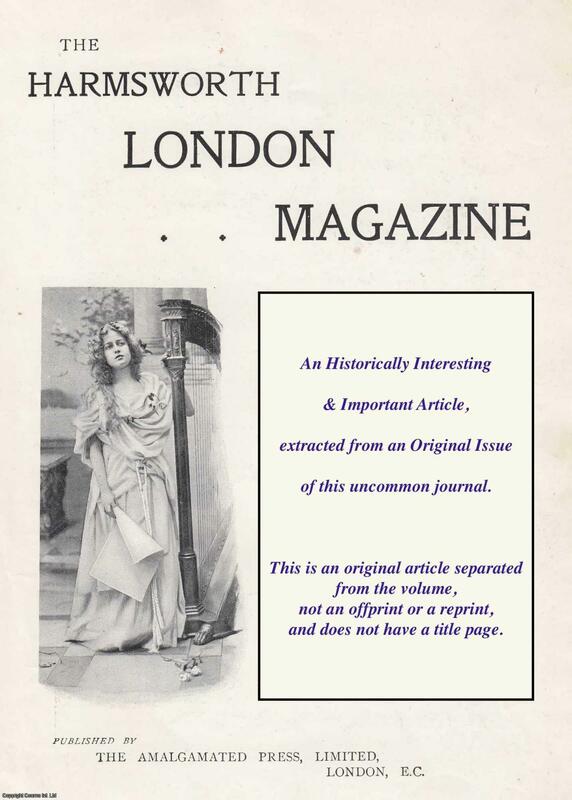 Category: Harmsworth London Magazine; Inventory No: 244648. Animal Act A Play. Remarable Performance By a Dog And A Cat. A rare original article from the Harmsworth London Magazine, 1899. The Harmsworth London Magazine. London, 1899. First Edition, Disbound. Very Good. 2 Pages, with photographs. Note; this is an original article separated from the volume, not a reprint or copy. Size: Octavo (standard book size). Quantity Available: 1. Category: Harmsworth London Magazine; Inventory No: 247964. Beauty in Advertising. The Development of Photographic Art in Business. A rare original article from the Harmsworth London Magazine, 1903. The Harmsworth London Magazine. London, 1903. First Edition, Disbound. Very Good. 6 pages and 11 illustrations. Note; this is an original article separated from the volume, not a reprint or copy. Size: Octavo (standard book size). Quantity Available: 1. Category: Harmsworth London Magazine; Inventory No: 244877. The Brain of a Great Railway. Striking Facts and Figures About Railway Management. A rare original article from the Harmsworth London Magazine, 1904. The Harmsworth London Magazine. London, 1904. First Edition, Disbound. Very Good. 4 pages. Note; this is an original article separated from the volume, not a reprint or copy. Size: Octavo (standard book size). Quantity Available: 1. Category: Harmsworth London Magazine; Inventory No: 245093. Can Insects Reason? Another Interesting Study in Intelligence by The Right Hon. Lord Avebury, Vice President of The Royal Society. A rare original article from the Harmsworth London Magazine, 1903. The Harmsworth London Magazine. London, 1903. First Edition, Disbound. Very Good. 5 pages and 6 illustrations. Note; this is an original article separated from the volume, not a reprint or copy. Size: Octavo (standard book size). Quantity Available: 1. Category: Harmsworth London Magazine; Inventory No: 244861. The Cigarette From Leaf to Lip. A Popular Smoke in all Its Stages. A rare original article from the Harmsworth London Magazine, 1904. The Harmsworth London Magazine. London, 1904. First Edition, Disbound. Very Good. 5 pages and 11 illustrations. Note; this is an original article separated from the volume, not a reprint or copy. Size: Octavo (standard book size). Quantity Available: 1. Category: Harmsworth London Magazine; Inventory No: 245010. Clever Families. Men Who Inherit Brains. A rare original article from the Harmsworth London Magazine, 1899. The Harmsworth London Magazine. London, 1899. First Edition, Disbound. Very Good. 8 Pages, with photographs. Note; this is an original article separated from the volume, not a reprint or copy. Size: Octavo (standard book size). Quantity Available: 1. Category: Harmsworth London Magazine; Inventory No: 247928. The Cleverest Amatuer Cyclist in the World. 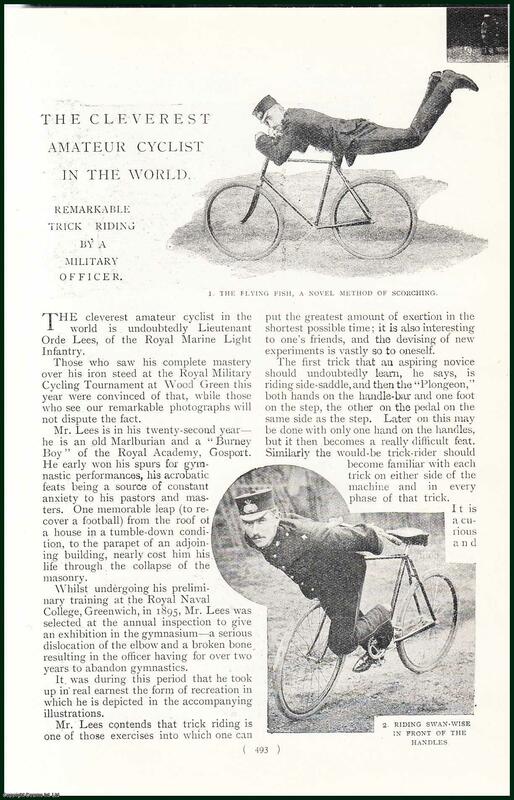 Lieutenant Orde Lees, of the Royal Marine Light Infantry and His Remarkable Trick Riding. A rare original article from the Harmsworth London Magazine, 1898-99. The Harmsworth London Magazine. London, 1898-99. First Edition, Disbound. Very Good. 4 Pages, with photographs. Note; this is an original article separated from the volume, not a reprint or copy. Size: Octavo (standard book size). Quantity Available: 1. Category: Harmsworth London Magazine; Inventory No: 247891. Costly Christmas Crackers. The Romance of Christmas Presents. [Messrs. Tom Smith & Co. ]. A rare original article from the Harmsworth London Magazine, 1898-99. The Harmsworth London Magazine. London, 1898-99. First Edition, Disbound. Very Good. 4 Pages, with illustrations. Note; this is an original article separated from the volume, not a reprint or copy. Size: Octavo (standard book size). Quantity Available: 1. Category: Harmsworth London Magazine; Inventory No: 247886. Cures by Diet. Simple Eating and Drinking Prescriptions for Treating Common Ailments. 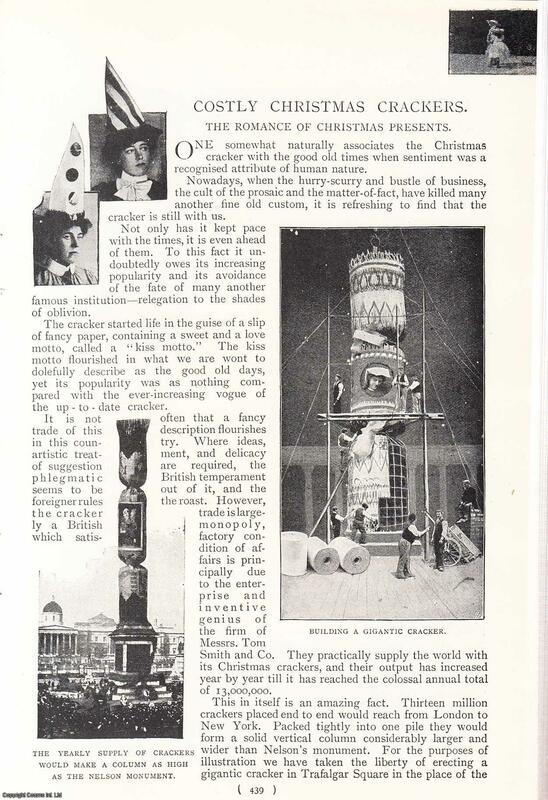 A rare original article from the Harmsworth London Magazine, 1903. The Harmsworth London Magazine. London, 1903. First Edition, Disbound. Very Good. 5 pages and 4 illustrations. Note; this is an original article separated from the volume, not a reprint or copy. Size: Octavo (standard book size). Quantity Available: 1. Category: Harmsworth London Magazine; Inventory No: 244848. 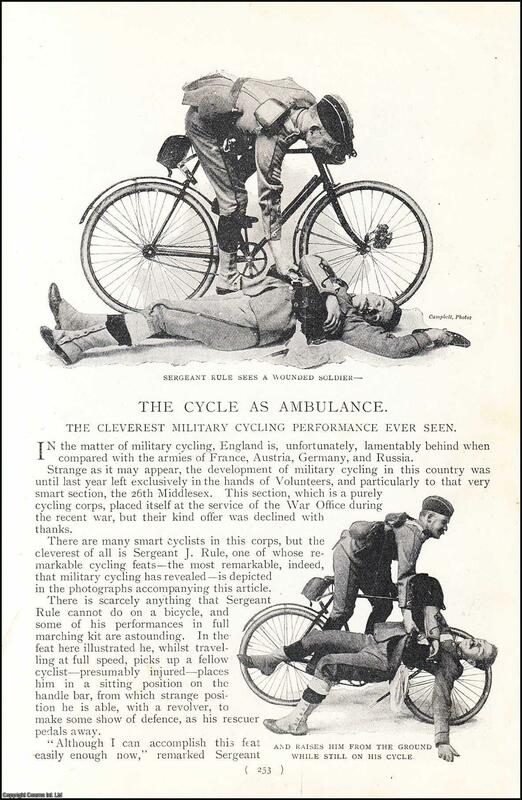 The Cycle As Ambulance. The Cleverest Military Cycling Performance Ever Seen. A rare original article from the Harmsworth London Magazine, 1901. The Harmsworth London Magazine. London, 1901. First Edition, Disbound. Very Good. 2 Pages, with photographs. Note; this is an original article separated from the volume, not a reprint or copy. Size: Octavo (standard book size). Quantity Available: 1. Category: Harmsworth London Magazine; Inventory No: 248077. A Cycling Rosalind. And How She Started A Race. A rare original article from the Harmsworth London Magazine, 1899. The Harmsworth London Magazine. London, 1899. First Edition, Disbound, Illustrated by: F.H. Townsend. Very Good. 4 Pages, with illustrations. Note; this is an original article separated from the volume, not a reprint or copy. Size: Octavo (standard book size). Illustrator: F.H. Townsend. Quantity Available: 1. Category: Harmsworth London Magazine; Inventory No: 247939. Doll Portraiture. The Latest Christmas Present in One's Photograph in Wax. 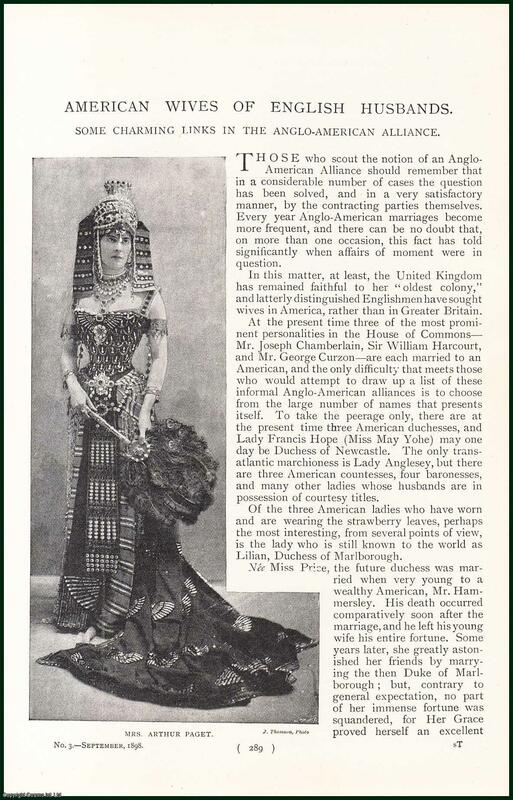 A rare original article from the Harmsworth London Magazine, 1903. The Harmsworth London Magazine. London, 1903. First Edition, Disbound. Very Good. 2 pages and 5 illustrations. Note; this is an original article separated from the volume, not a reprint or copy. Size: Octavo (standard book size). Quantity Available: 1. Category: Harmsworth London Magazine; Inventory No: 244878. Drinks Under The Microscope. A rare original article from the Harmsworth London Magazine, 1903. The Harmsworth London Magazine. London, 1903. First Edition, Disbound, Illustrated by: T. A. O'Donohoe. Very Good. 4 pages and 6 illustrations. Note; this is an original article separated from the volume, not a reprint or copy. Size: Octavo (standard book size). Illustrator: T. A. O'Donohoe. Quantity Available: 1. Category: Harmsworth London Magazine; Microscopy. Inventory No: 244815. Escapes From Siberian Prisons. By One Who Knows Them. 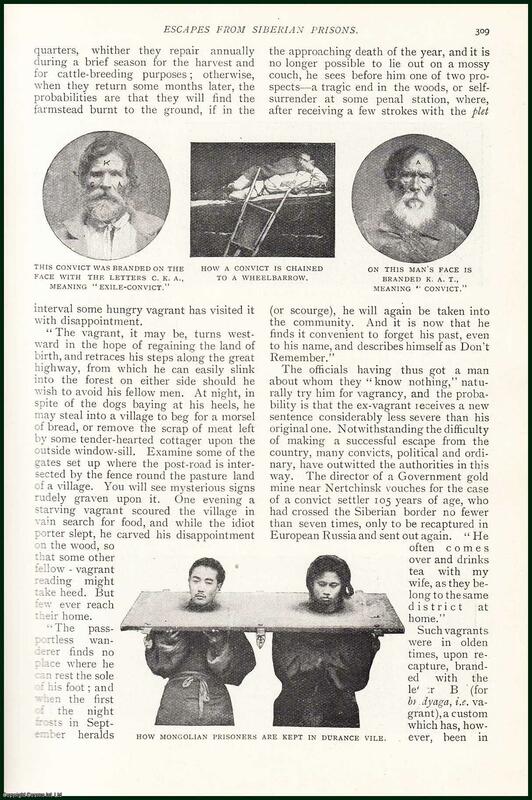 A rare original article from the Harmsworth London Magazine, 1899. The Harmsworth London Magazine. London, 1899. First Edition, Disbound. Very Good. 4 Pages, with illustrations. Note; this is an original article separated from the volume, not a reprint or copy. Size: Octavo (standard book size). Quantity Available: 1. Category: Harmsworth London Magazine; Inventory No: 247946. A Famous Battle Painter. Edouard Detaille and His Work. A rare original article from the Harmsworth London Magazine, 1903. The Harmsworth London Magazine. London, 1903. First Edition, Disbound. Very Good. 7 pages and 5 illustrations. Note; this is an original article separated from the volume, not a reprint or copy. Size: Octavo (standard book size). Quantity Available: 1. Category: Harmsworth London Magazine; Inventory No: 244890. Famous Cricket Families. Born Batsmen and Bowlers. A rare original article from the Harmsworth London Magazine, 1899. The Harmsworth London Magazine. London, 1899. First Edition, Disbound. Very Good. 6 Pages with photographs. Note; this is an original article separated from the volume, not a reprint or copy. Size: Octavo (standard book size). Quantity Available: 1. Category: Harmsworth London Magazine; Inventory No: 247957. Fish Photography. Snap-Shotting Some Beautiful Citizens of The Deep. A rare original article from the Harmsworth London Magazine, 1902. The Harmsworth London Magazine. London, 1902. First Edition, Disbound. Very Good. 6 pages and 13 illustrations. Note; this is an original article separated from the volume, not a reprint or copy. Size: Octavo (standard book size). Quantity Available: 1. Category: Harmsworth London Magazine; Inventory No: 244723. Founders of Modern Creeds. Facts and Figures about some English Religious Denominations. A rare original article from the Harmsworth London Magazine, 1903. The Harmsworth London Magazine. London, 1903. First Edition, Disbound. Very Good. 8 pages and 10 illustrations. Note; this is an original article separated from the volume, not a reprint or copy. Size: Octavo (standard book size). Quantity Available: 1. Category: Harmsworth London Magazine; Inventory No: 244918. From The Willow Tree To Lord's. 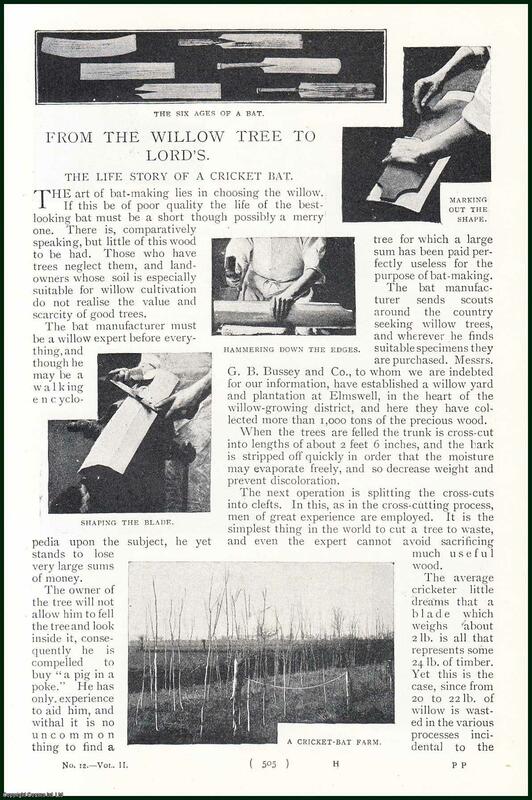 The Life Story Of A Cricket Bat. A rare original article from the Harmsworth London Magazine, 1899. The Harmsworth London Magazine. London, 1899. First Edition, Disbound. Very Good. 3 Pages, with photographs. Note; this is an original article separated from the volume, not a reprint or copy. Size: Octavo (standard book size). Quantity Available: 1. Category: Harmsworth London Magazine; Inventory No: 247970. 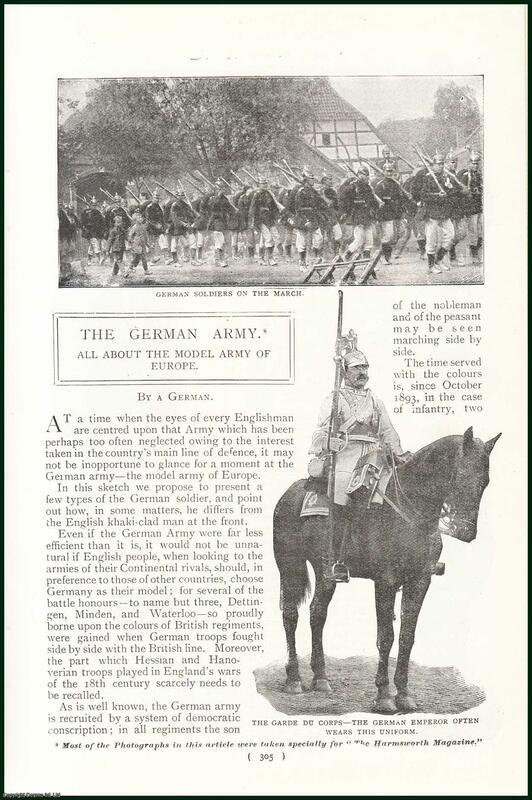 The German Army. All About The Model Army Of Europe. A rare original article from the Harmsworth London Magazine, 1901. The Harmsworth London Magazine. London, 1901. First Edition, Disbound. Very Good. 8 Pages, with photographs. Note; this is an original article separated from the volume, not a reprint or copy. Size: Octavo (standard book size). Quantity Available: 1. Category: Harmsworth London Magazine; Inventory No: 248079.